Situated in front of the replica Buddhagaya Chedi, this structure faces north. It is built in the Central-region style of Vihara on a raised basement with a Jaturamuk-style (in the shape of a cross) hall where the Ariya Metteyya Buddha image is established. The Ariya Metteyya Buddha image was designed by Mr. Fua Haripitak, the 1985 National Artist in visual arts, from the vision perceived by Mr. Pranart Tattanond who sponsored its crafting. With the start of the preparation stage in 1964, the work was finally completed in 1984. 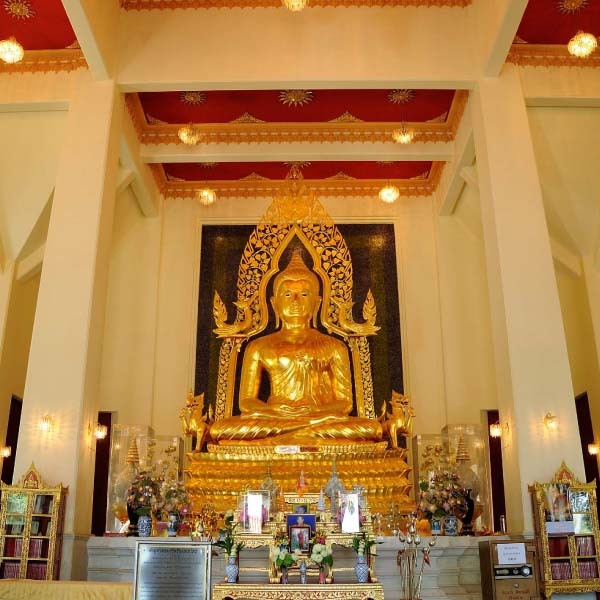 To fulfill the goal of this project, the Buddha image was presented to His Majesty King Bhumibol Adulyadej who later had it established in this chapel. The bright golden body of Phra Sri Ariya Metteyya Buddha is made from 84,044 bronze alms bowl covers. The number 84,044 comes from the combination of 84,000 Buddhist dharma teachings, 12 zodiac signs, and 32 human organs.